his left arm. Undeterred, Livingstone continued his exploration of the African interior, particularly the Zambezi River area in 1852-1856. It was during this expedition that he became the first European to witness the magnificence of Victoria Falls. In 1866, Livingstone set out at the head of an expedition charged with the task of finding the headwaters of the Nile River. His lack of contact with the outside world over a period of four years raised concerns for his welfare and prompted the New York Herald to send Henry Stanley to find Livingstone. 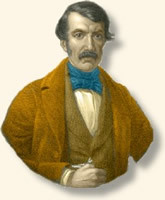 Stanley achieved his goal on November 10, 1871 approaching the explorer in an African village with the immortal words "Dr. Livingstone I presume" (see Stanley Finds Livingstone, 1871) Years in the wilderness took their toll however, and David Livingstone died in Africa in April 1873 at age sixty. A Scene "Gazed Upon by Angels in Their Flight"
"After twenty minutes' sail from Kalai we came in sight, for the first time, of the columns of vapor appropriately called 'smoke,' rising at a distance of five or six miles, exactly as when large tracts of grass are burned in Africa. Five columns now arose, and, bending in the direction of the wind, they seemed placed against a low ridge covered with trees; the tops of the columns at this distance appeared to mingle with the clouds. They were white below, and higher up became dark, so as to simulate smoke very closely. The whole scene was extremely beautiful; the banks and islands dotted over the river are adorned with sylvan vegetation of great variety of color and form�no one can imagine the beauty of the view from any thing witnessed in England. It had never been seen before by European eyes; but scenes so lovely must have been gazed upon by angels in their flight. The only want felt is that of mountains in the background. The falls are bounded on three sides by ridges 300 or 400 feet in height, which are covered with forest, with the red soil appearing among the trees. When about half a mile from the falls, I left the canoe by which we had come down thus far, and embarked in a lighter one, with men well acquainted with the rapids, who, by passing down the centre of the stream in the eddies and still places caused by many jutting rocks, brought me to an island situated in the middle of the river, and on the edge of the lip over which the water rolls. In coming hither there was danger of being swept down by the streams which rushed along on each side of the island; but the river was now low, and we sailed where it is totally impossible to go when the water is high. But, though we had reached the island, and were within a few yards of the spot, a view from which would solve the whole problem, I believe that no one could perceive where the vast body of water went; it seemed to lose itself in the earth, the opposite lip of the fissure into which it disappeared being only 80 feet distant. At least I did not comprehend it until, creeping with awe to the verge, I peered down into a large rent which had been made from bank to bank of the broad Zambesi, and saw that a stream of a thousand yards broad leaped down a hundred feet, and then became suddenly compressed into a space of fifteen or twenty yards. The entire falls are simply a crack made in a hard basaltic rock from the right to the left bank of the Zambesi, and then prolonged from the left bank away through thirty or forty miles of hills. If one imagines the Thames filled with low, tree-covered hills immediately beyond the tunnel, extending as far as Gravesend, the bed of black basaltic rock instead of London mud, and a fissure made therein from one end of the tunnel to the other down through the keystones of the arch, and prolonged from the left end of the tunnel through thirty miles of hills, the pathway being 100 feet down from the bed of the river instead of what it is, with the lips of the fissure from 80 to 100 feet apart, then fancy the Thames leaping bodily into the gulf, and forced there to change its direction, and flow from the right to the left bank, and then rush boiling and roaring through the hills, he may have some idea of what takes place at this, the most wonderful sight I had witnessed in Africa. On the left of the island we see the water at the bottom, a white rolling mass moving away to the prolongation of the fissure, which branches off near the left bank of the river� The walls of this gigantic crack are perpendicular, and composed of one homogeneous mass of rock. The edge of that side over which the water falls is worn off two or three feet, and pieces have fallen away, so as to give it some- what of a serrated appearance. That over which the water does not fall is quite straight, except at the left corner, where a rent appears, and a piece seems inclined to fall off Upon the whole, it is nearly in the state in which it was left at the period of its formation�On the left side of the island we have a good view of the mass of water which causes one of the columns of vapor to ascend, as it leaps quite clear of the rock, and forms a thick unbroken fleece all the way to the bottom. Its whiteness gave the idea of snow, a sight I had not seen for many a day. As it broke into (if I may use the term) pieces of water, all rushing on in the same direction, each gave off several rays of foam, exactly as bits of steel, when burned in oxygen gas, give off rays of sparks. The snow-white sheet seemed like myriads of small comets rushing on in one direction, each of which left behind its nucleus rays of foam." 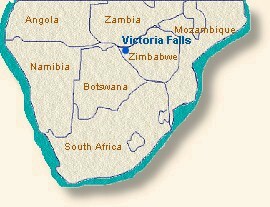 "Livingstone Discovers Victoria Falls, 1855," EyeWitness to History, www.eyewitnesstohistory.com (2000). After his death, Livingstone's body was transported to England and buried in Westminster Abbey. His heart remained in Africa however, buried at the foot of the tree where he died in modern-day Zambia.